The little town we live in, Mazomanie, has a long-standing tradition. 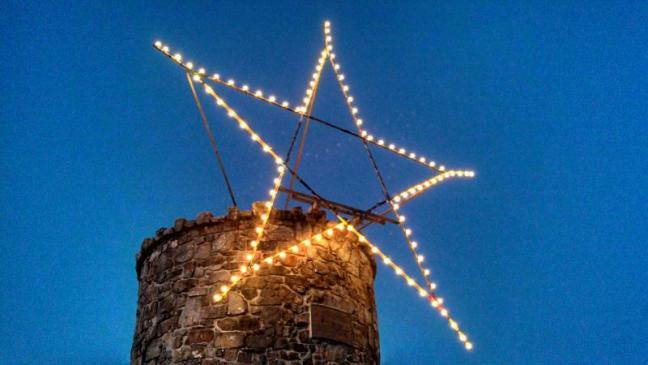 On the tallest hill on the edge of town, a star is lit the Sunday after Thanksgiving. It continues to be lit through the holidays. For many in the area, it is a perpetual symbol of Christmas. This year, the star glows especially bright in the night air. It was refurbished with LED lights. It seems that the aura from this star is a bit more and can be seen from a bit farther this year. A couple of weeks ago, I came home in the evening. It was dark. The moon was near full. A cloud covered part of the moon. As I stood looking at the moon, just to the right was the brightly light star on the hill. Unfortunately, I did not take the time to take my camera outside and capture the stunning sight. This is the time of year when those of us in the northern hemisphere have the shortest amount of daylight in a day. We’re not really sure what the exact date of Jesus’ birthday was. Some speculate that it could be this time of the year, as the nightly stars would have had the longest time to be visible for the magi to follow. Personally, the exact date of Jesus’ birth is not nearly as significant as the mere fact he was born. At the time of his birth, the Jewish people were struggling in their ability to follow God. It seemed as if God might have abandoned them. But God did not. Instead, Jesus came into this dark and sinful and dreary world to shine some light into people’s lives. This continues to be the purpose of Immanuel, God with us, yet today. Not all of our days are perfect, stellar or just as we had planned. On those days when we feel far from God, when life doesn’t make sense, there continues to be Immanuel, who continues to be with us. In a few hours, I pray we will take the time to worship the new-born king, the Light of this World. 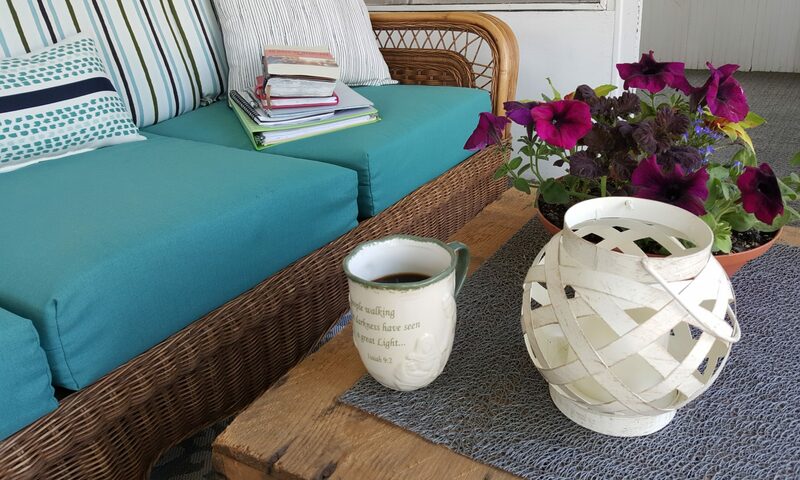 Pause this day. 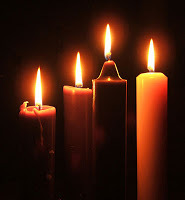 Look at the lights on your tree, a lit candle during candle light worship tonight, the glow from an Advent Wreath. May each of these glows reflect the Light of the World for us this Christmas. Almighty God, soon we celebrate another birthday of Immanuel, God with us. Please place his glow, his light in our lives this day. Thank you for this tremendous gift. Amen. 1 John 3:16-18: This is how we know what love is: Jesus Christ laid down his life for us. And we ought to lay down our lives for our brothers and sisters. If anyone has material possessions and sees a brother or sister in need but has no pity on them, how can the love of God be in that person? Dear children, let us not love with words or speech but with actions and in truth. As some Wisconsin people did not have church today, I am posting the message I would have shared. I know it is longer than my normal devotional. Also, Mike Slaughter, not I, came up with the idea that Christmas is not our birthday. Just want to give appropriate recognition. Enjoy! A few weeks ago, I stopped by our grandkids. They were busy making Christmas lists to send to Santa. Ellie and Dylan, 3 and 2, were “drawing” what they would like. Six-year-old grandson Waylan told me exactly what he wanted, the store it could be purchased and how much it cost. As a child, I put together a Christmas wish list. Armed with the Sears & Roebuck catalog, I listed on a piece of paper the item, page number, size and color if necessary. When done, we’d post them on the fridge. Since my parent’s didn’t have a lot of resources, each item was carefully chosen. Contrast this with our granddaughter Ellie. When the American Doll catalog arrived, she circled the items she would like. Later, she asked her Mom if she could have the catalog back because she didn’t circle everything. Most kids think of Christmas like a second birthday, often a bigger and better deal! We encourage kids to “be good” or Santa won’t visit. Christmas can stressful as we try to find the “perfect” gift. The financial implications can also be overwhelming. According to the National Retail Federation, in 2010, adult consumers spend on average $830 each for holiday food, decorations and presents. In a two-adult house, this is over $1,600. Presents are an important part of Christmas. They help us share with those we love. Presents come from the tradition of the magi presenting gifts to Jesus. But too often, we’ve forgotten Christmas is not our birthday. It’s really Jesus’ birthday. Too often, we make being a Christian about us. But it’s not. It’s not about us. It’s about God. It’s about a baby in a manger. It’s about what God can do through us if we are willing to be the Lord’s servant. At Christmas we celebrate the human birth of the only man who truly knew how to live sacrificially. In our scramble to prepare for Christmas, I encourage us to pause and remember whose birthday we celebrate. Let’s reclaim the broader meaning of Jesus’ birth so we can experience a Christmas with more peace and joy than any toy or gadget could ever bring. How are your celebrations organized, designed and focused on celebrating Jesus’ birthday? How can we make it less about us and more about him? What can we possibly give the Lord of the universe? Fortunately, Jesus made it easy for us to know what he’d like for a birthday present. His wish list is found in Matthew 25. What is on Jesus’ wish list? Jesus simply wants us to give food to the hungry, water to someone who is thirsty, invite strangers into a warm place, clothing for those who don’t have enough and to visit the sick and those in prison. This is all Jesus wants. He even says that when we do one of these things for someone else, it’s as if we’re doing it for Jesus. Jesus makes it clear that when we have a relationship with God, we can’t separate our relationship with God from our responsibility for God’s people. 1 John says that if we see someone who has a need and we do not assist them, we don’t really have God’s love inside of us. We can talk about doing the right things. Unless we put ourselves and our words into action, we aren’t being honest. Jesus’ wish list would be for us to serve others. When we serve others, we serve God. Since the church is the Body of Christ, we are the only hands, feet and wallets God has! I’m not suggesting to completely stop buying presents. Let’s just think about what we do. How often do we struggle with what to get someone who needs nothing? Can we cut back what we give our families and give to those who have unmet basic needs? None of us can eliminate poverty or hunger or homelessness. But we can help one person, one family, one child. Jesus would like us to celebrate Christmas by giving ourselves sacrificially to the world. A Christ-filled Christmas would be more for Jesus and less for us. These gifts make Jesus smile on his birthday! Christmas shouldn’t be about spending, eating and stress. We discover Christmas’ true meaning when we sacrificially give to those in need. As we do this, we remember it’s Jesus’ birthday and not our birthday. The best Christmas gifts I receive are the ones someone gives to a needy person in honor of me. The best gifts I give to someone else is teaching them how to give to someone else. Sometimes it’s hard to make changes in our lives to honor Jesus. If you are willing to do all you can, God will do all that you can’t. That’s how miracles happen. Miracles are a partnership between ordinary people who do all they can and allow God to do what they can’t. Every spirit-filled Christian has the potential for a God movement within him or her. When ordinary people are willing to dream God’s dreams and allow them to happen, amazing things happen. Each Christmas, one couple I know does not purchase gifts for each. Instead, they pick a couple struggling families and give them money, groceries and or gas cards. One family who received a gift from this couple came to me last Christmas. The previous year, the husband was out of work for several months. A year later, he had a job. He handed me the same amount of money his family had received the previous Christmas. He wanted me to pay this money forward to another struggling family. I had just become aware of a family unable able to pay December rent. It was mid-December. While the amount did not cover the entire rent, it was put towards their rent. As I handed the money to the second mom, she was overwhelmed. A miracle had just happened. The first family became God’s face to the second family. What miracle is God waiting to birth through you? What plan does God have for you, your family, for how you can become God’s face to someone else? We are the picture of God to others. I, you, can be God’s image to someone else if we allow God to enact a miracle through us. If I do all that I can, God will do the rest. Last Thanksgiving, I traveled to Argentina with my friend Kristin. Kristin is a high school Spanish teacher and used this trip as continuing education. When Kristin asked me to join her, I had one request: we do service projects while there to count towards my continuing education. While in Argentina, we went the city of Chacobocu. We spent a chunk of one day at an orphanage. Kids who don’t have a place to live stay at the orphanage until a permanent living situation can be arranged. Sometimes the kids don’t have family. Sometimes the parents can’t provide. One boy’s parents who lived in a dump dropped him off. As soon as we walked into the orphanage, the kids ran up to us, arms outstretched, waiting for us to pick them up. They couldn’t understand why I didn’t speak Spanish and told Kristin the Spanish she spoke didn’t sound right. They wanted to touch us, hug us and play with our lighter-colored hair. We had brought items for them: clothes, backpacks, underwear, socks, toothbrushes and toothpaste, crayons, glue and scissors. I’d brought along crafts and we spent the afternoon doing them. They loved them! One girl made the same necklace six times over. Each time, she proudly asked me to tie the newest one around her neck, thrilled. Most kids would have wanted a new craft each time, but this little girl was happy to make the same one over and over. As we finished up, there were sheets with a couple stickers left on them. Some kids asked if they could keep a sticker page because they wanted something for themselves; something they didn’t have to share with anyone else. Think about it. If God were going to choose a mother for the Messiah today, would God most likely show up in the Yale college dorm room or to a teenage girl at a Chacoboco orphanage with only a couple necklaces and a few stickers to call her own? God looks for humble people who don’t expect special treatment or recognition. Not all of us can go to Chacobuco. We don’t have to. How can you help someone in your community? How might we humbly serve others this Christmas? How might I take some blessings I have and share with someone? As Kristin and I were preparing to leave the foundation, we went into the kitchen where the woman making the evening meal spoke to us. With tears in her eyes, the woman thanked us for being a bright shining star for those kids that day. We were completely humbled. Kristin shared back that while we were grateful to be a bright light for them one day, she is a bright light to those kids every day. We put lots of energy into making Christmas perfect, memorable and special. While we try to make Christmas perfect, it isn’t. The first Christmas was not perfect by human standards. For some, Christmas isn’t a fun holiday but a reminder of something or someone missing. If you don’t feel like celebrating, just remember it’s not your birthday party. It’s Jesus’ birthday. It’s only a couple more days before Christmas. What you will give Jesus for Christmas this year? 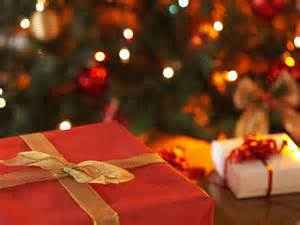 Is your gift something Jesus would want? Is it on his wish list? What is on Jesus wish list? God wants you – your time, your talent, your treasure – to serve others. It’s this simple. It’s not too late to get JC a present yet this Christmas. Will you make sure and give him a gift? Forgive us, Lord God, when we forget whose birthday we celebrate at Christmas. Forgive our self-centeredness when we focus on our wants and needs more than your wants. I pray your Spirit will instill within us a desire to reclaim Christmas more in the spirit you desire. Give is courage to go where we don’t want to go, to make sacrifices to follow you. Forgive us for the times we’ve chosen ease and comfort over your will. Forgive us for the times when we didn’t make ourselves available for your kingdom. As a church, may we walk humbly in this community and offer our lives daily. Here we are, your servants. 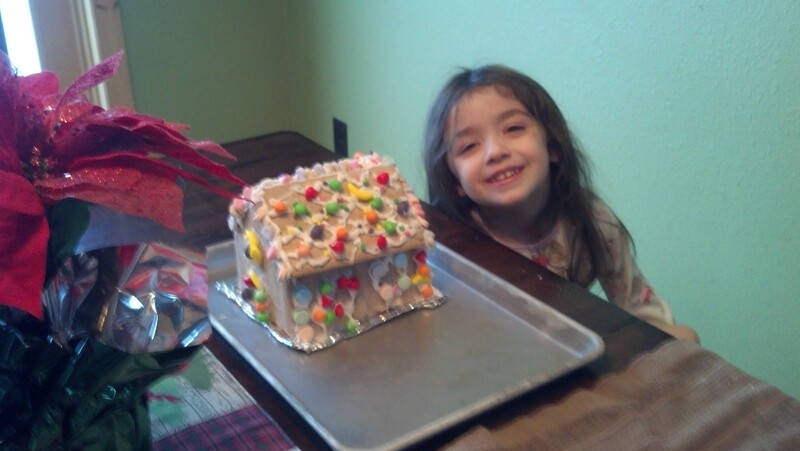 Ellie and her gingerbread house. And she gave birth to her firstborn, a son. She wrapped him in cloths and placed him in a manger, because there was no guest room available for him. On Tuesdays, I have the great joy of spending the day with our youngest two grandchildren. Three-year-old Ellie loves to cook. Most weeks, we make cupcakes, brownies or cookies. This week, I had a different plan. Seeing a gingerbread house kit at the store, I thought this would be a great project. Ellie had already eaten breakfast when I arrived at 6:40 AM on Tuesday. She was ready to do a project. When I showed her the gingerbread kit, she was so excited. We began building the house immediately. I had never made a gingerbread house. The kit made it quite easy. I cut out the house base and covered it with aluminum foil. The directions showed us how to ice together the four walls. We were to wait 15-20 minutes to let the icing set. Twenty minutes for a three-year-old is like half a day! Probably before the walls were completely set, we added the roof. At this point, Ellie couldn’t wait any longer to start decorating with the candies. If we didn’t start soon, the candies would disappear fast. I piped on the frosting and Ellie creatively put candies on edge across the roof bridge. Isn’t it interesting how quickly the icing for decorating dries in contrast to when we wanted the walls to dry? We decorated the roof, the windows, around the door all while two-year-old Dylan sat in his chair, watching and eating Apple Jacks. As the candy ran out and with the icing long gone, Ellie proclaimed, “Dianne, this house is so cool.” She was completely right. As we decorated our little gingerbread house, I thought of the “house” where baby Jesus was born. Probably more of a cave than a barn, it would have been terribly small. I doubt there were any fancy decorations or brightly colored carpets. It might have been quite cold, drafty and stinky. As Mary delivered her baby with no trained help, I doubt she looked around and thought, “This is so cool.” Yet this is exactly where the Messiah was born; in the most unlikely of places. 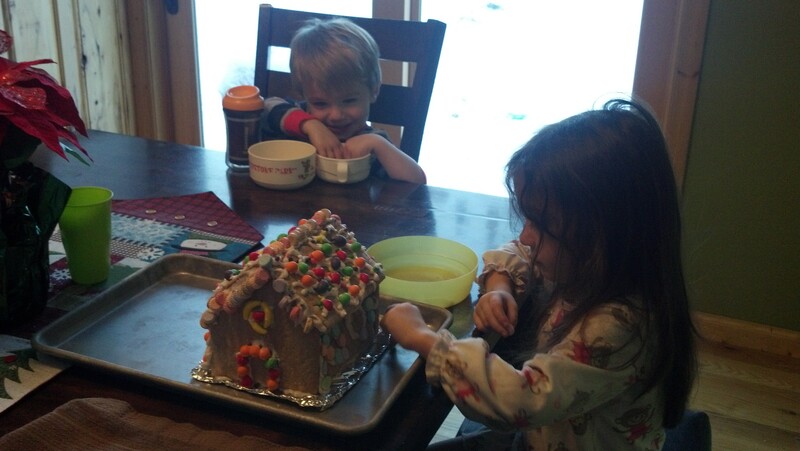 Overall, I would call our first gingerbread house experience a success. When we came back to the house after lunch, the walls were leaning in a bit. The weight of the candy with not completely dried construction probably caused the leaning. But the house was still cute. It was still neat. It was still the house that Ellie built. Jesus came as a baby into this world, carrying the weight of the world on his tiny shoulders. He endured lots of criticism, challenges and stress. He didn’t bow away from this, but knew this was the house he was to build. Thank the Lord he did. Almighty God, the details of Christ’s birth seem so strange to us. They just don’t really make sense. Why a cave? May we see this as just another symbol of how important being of this world was. Thanks for building a kingdom that never ends. Amen. I love music. When I plan a worship service, it usually includes lots of music. Advent and Christmas are no exception. I spend hours finding the right songs convey the same message I will share in my message. I realized one day I had not played any Christmas music this year. I was at the library with two grandkids. We routinely attend Tuesday morning story time. We cannot leave without armfuls of books. While checking out, I noticed a display of Christmas CD’s. I quickly grabbed a couple and threw them on the counter. Both Ellie and Dylan had disappeared in those 60 seconds I was distracted. With no CD player at my in-laws, I put the CD’s into my laptop and the songs repeat over and over. Then, I remembered the Madison Christian radio station is playing Christmas songs 24 hours a day. Now, I have the online version in the background. What is your favorite Christmas carol? This is a very difficult question for me. 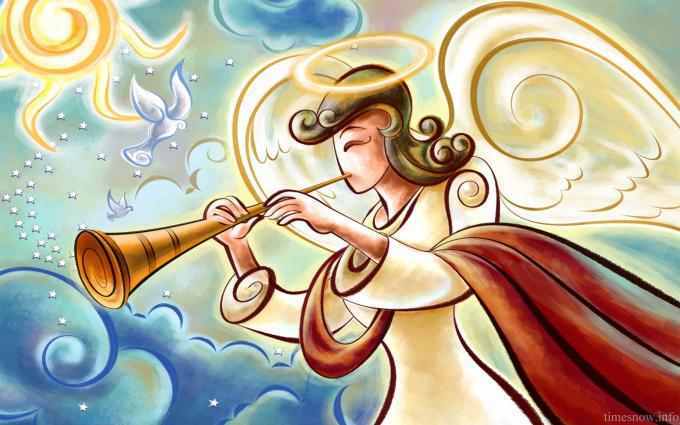 I love some traditional songs: What Child is This, O Come All Ye Faithful and of course the chorus in Angels We Have Heard on High. The right person singing O Holy Night can literally make a Christmas Eve service. There is a popular 50’s song called Star of the East. I just love it the harmony in the chorus. Many contemporary Christmas songs are also meaningful. Mary Did You Know and Breathe of Heaven tell the story from Mary’s perspective. The Trans-Siberian version of Canon in D takes one of my all-time favorite songs and makes it Christmas. What is not to love about this version? A pianist at a church I served loved Joy to the World. She often told me she wanted this song at her funeral. I obliged and we sang it at her service. Christmas carols honestly began the night of Christ’s birth. While we read the words of the angels, I imagine them being set to a wonderful tune. I can almost hear the three-and-four part harmony as they overwhelmed the scared shepherds. With this type of announcement, how could the shepherds not leave their flocks and search for the Christ child? So what is your favorite Christmas carol? Why? I’d love to hear your responses. Give me your best argument of why your favorite Christmas song should be mine. As you can see, it’s impossible for me to pick one. Thank you, Lord God, for all the many, many people who have been inspired and lead to write such beautiful and deeply meaningful Christmas songs. May the words of these songs inspire us to ponder the story in new and different way. In these days leading to the birth of your Son, may music be a regular and important way for us to embody this great story once again. Amen. It is December 8th – the second Sunday of Advent. How are your Christmas preparations progressing? Mine are very slow. Last week, I shopped for our grandchildren’s presents. One night, I even wrapped them. I’m not sure when we will celebrate Christmas with them, but the presents are ready. This is the extent of what I have done for Christmas. I’m not sure when and where we are celebrating. Haven’t decided if I am sending Christmas cards. I’m thinking of making rosettes, one of my Dad’s favorite Christmas cookies but haven’t dug out the special iron yet. We have no outside decorations up, the tree hasn’t been bought. My traditions of lighting a family Advent Wreath and putting out the nativity set have not been done. These are things I enjoy. We did them last year, even though December was filled with hospital visits, nursing home visits, decisions about our parent’s health. We plunged on. I wanted the make Christmas as “normal” as possible, even though my Dad was dying. Last Christmas Day morning, our joyous thoughts came to a screeching halt. The nursing home called and said Rick’s Mom was bleeding. She was being taken to the hospital and we needed to get there as quickly as possible. She pulled through and we had another 11 months with her, for which we feel very blessed. I do not have the same drive this Advent and Christmas season. Sometimes, this is OK. Several years ago, Rick’s oldest son was killed. He wanted to go directly from the day before Thanksgiving to after New Year’s and skip the day’s in-between. Since it was our first Christmas as a married couple, I wanted to create traditions for us. I suggested we not do every tradition he was used to. But as a pastor, it’s nearly impossible to skip Christmas all together. Saturday night, several of our Vielhuber family decorated my in-laws house for Christmas. The tree (which never got out of the box last year) glows in the front room tonight. The gold garland is strung along the open staircase banister. I’m not sure the house is decorated just as Rick’s Mom did. And this is OK. Most people love traditions. They are important. Often, these traditions have developed over generations. Sometimes, traditions can also be difficult. Let us give ourselves grace when this happens. For in the end, Christmas is not about perfectly matched Christmas dishes and linens. It’s not about gorgeous plaid bows and twinkling lights. It’s about the birth of God’s son. This is the tradition that is most important. 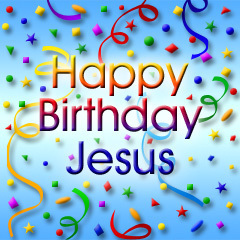 In our scurry to create the “perfect” holiday, Lord God, let us not forget whose birthday we celebrate. May the traditions we continue draw us back to that first Christmas, which was anything but perfect. Amen. And she gave birth to her firstborn, a son. She wrapped him in cloths and placed him in a manger because there was no guest room available for them. Many years ago, I discovered the pure joy of flannel sheets. For anyone who lives in a cold climate, come winter, flannel sheets are wonderful! They warm me up soon after crawling in-between the sheets. I had not changed to flannel sheets at Rick’s folks until last week. And the weather was cool enough so I truly appreciated them. This morning, it was just a bit difficult to crawl out from between the soft, warm flannel sheets. Yesterday, I discovered a little nativity set of my mother-in-laws. The figurines are small, just a couple inches high. I placed them on the big window ledge in the front room. Today, when three-year-old Ellie was here, she was fascinated with the little figurines. I had the magi and the shepherds and the animals stretched across the window sill. Ellie rearranged them; all grouped together, with Baby Jesus smack dab in the middle. The animals peaked in to see the baby in the manger. Ellie knew who Baby Jesus was. I helped her fill in the rest of the story. We talked about how Mary is Jesus’ mother and Joseph was his earthly father, remembering that God is his real father. We talked about how three guys traveled a long ways to see Baby Jesus and brought him special gifts. The shepherd, well, he was taking care of the animals. And Baby Jesus was born in a barn because his parents couldn’t find a house to stay in. Some hay can be soft and sweet smelling. But not all straw is like this. It is seldom as soft and warm as my flannel sheets. Yet, this is how the Savior of the World spent his first hours: lying on some smelly, stinky hay. I’m not sure how cold it was that night. 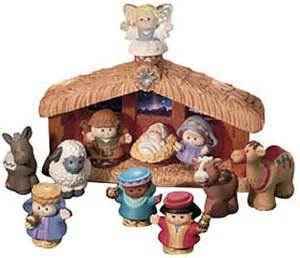 But isn’t it interesting that straw in a manger was good enough for Jesus. Makes me appreciate my flannel sheets all the more. Lord God, your choices for how the Savior entered the world often does not make sense to us. Why would a king be born with animals and smelly shepherds? Why wasn’t he laid in expensive cloth rather than course straw? May Jesus’ humble entry into this world keep us humble. Amen. 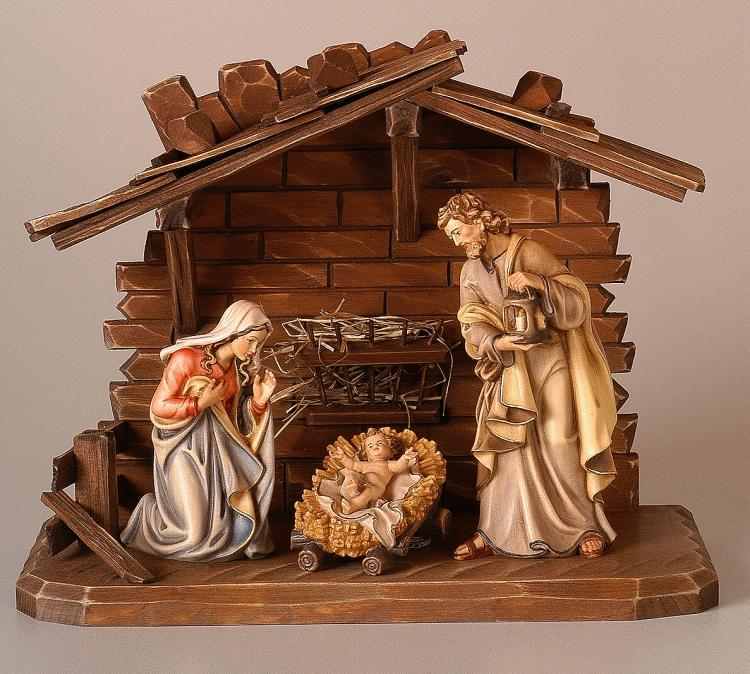 On coming to the house, the Magi saw the child with his mother Mary, and they bowed down and worshiped him. Then they opened their treasures and presented him with gifts of gold, frankincense and myrrh. Last week, Rick and I stopped at his son’s house. The three kids (6, 3 and 2) were at the kitchen table making Christmas lists to send to Santa. Since the 3- and 2-year-olds can’t write, they were drawing pictures. I asked Ellie what her pictures were. She stared at me as if I should know what her little scribble marks were. Waylan’s list was well printed. I questioned him about something on the list. He told me what store it was at and how much it cost! How is that for helping Grandma with Christmas shopping! I remember sitting down with the big, fat Sears & Roebuck catalog and writing on a piece of paper what I wanted for Christmas. My parents could not afford much. So I only put the most important things on the list. Contrast this to our precious Ellie. When they received the American Girl catalog, Ellie’s mom encouraged her to circle the things she liked. Ellie complied. Later, she asked for the catalog back because she hadn’t circled everything. It has been decades since I’ve made a Christmas list. Rick and I do not exchange presents. We have no needs. We buy things for kids who really have needs. Our gifts include practical items. But we also buy fun things like sleds and dolls. Thinking of others more than we think of ourselves and living this in our actions. Admitting when we are wrong and asking for forgiveness. Biting our tongues so we listen more than we speak. Respecting those whose views or opinions may be different than ours. Humbleness in our actions so attention goes to Jesus, the Light of the World. Expecting less and giving more. Appreciating each sunrise and sunset, knowing every day is simply a present. I stopped to buy Waylan’s present today. He called it a cow stanchion. I asked the sales clerk about the stanchions they had. He pointed out a blue cow chute. The price tag was the same amount Waylan had told me. The sales clerk asked if a special boy was getting the cow chute. I said yes. Rick and I are fortunate we can buy presents for our grandkids. My prayer this Advent, is that I will spend more time embodying and living out the things on my grown-up Christmas list. These are the most important things I can pass onto our grandchildren. Lord, God, when we think of the gifts the magi brought to baby Jesus, they almost do not make sense. We’d expect a fuzzy blanket or a seat for Joseph to strap to a donkey for baby Jesus to ride in. But Lord God, the presents you desire from us are never exactly what we would put first on our list. This Advent, place in our hearts meaningful grown-up Christmas lists that embody the type of giving you so desire from us. Amen. Today is the beginning of Advent. Advent is a time of waiting, of anticipation, expectation and preparing for the coming of the Christ Child on Christmas Eve. The Advent Season crept up on me this year. Since I am not actively serving a church, l have not gone through the pre-Advent preparations. Normally by now, I would have written and distributed weekly Advent Wreath readings; completed a “Hanging of the Greens” worship service which reminds us of how Christmas decorations represent the life of Jesus; be in the final preparation stages for the “Live Nativity,” a re-enactment of the first Christmas; planned Advent and Christmas music for worship services. I love overseeing these Advent preparations. This year, I am more sentimental. Eleven months ago my Dad passed away and two days ago we had the funeral service for Rick’s Mom. These events relate to the end of life moreso than a baby’s birth. It’s not just about the manger where the baby lay. It’s not all about the angels who sang for him that day. It’s not just about the shepherds or the bright and shining star. It’s not all about the wise men who travelled from afar. It’s about the cross. It’s about my sin. It’s about how Jesus came to be born once so that we could be born again. It’s about the stone that was rolled away so that you and I could have real life someday. It’s about the cross. This is the story we are to anticipate, expect and plan to hear once again. When we prepare for Christmas, our most important preparations are not baking cookies or buying presents or decorating a tree. The most important preparation is anticipating the child whose single life changed the world. For some, Christmas is not a joyous season. It’s a reminder of those who have passed on from this life. I pray as we prepare for Christmas this year, we will be reminded again that because of this child’s life we celebrate, those we miss have the opportunity to experience real life. Contemplating this real life is the most important of all our Advent and Christmas preparations. I pray we will embody this throughout Advent. Lord God, remind us that it’s not just about the presents underneath the tree. It’s not all about the feeling that the season brings. It’s not just about coming home to be with those you love. It’s not all about the beauty in the snow I dream of. No, it’s about the cross. It’s about my sin. It’s about how Jesus came to be born once so that we could be born again. May this be the focus of my Advent preparation this December. Amen.